Image caption The number of jobs at the bottom of the skills ladder increased by two million last year, according to Sir Charlie Mayfield. More than a fifth of UK jobs only require the educational level of an 11-year-old, the chairman of the John Lewis Partnership has highlighted. 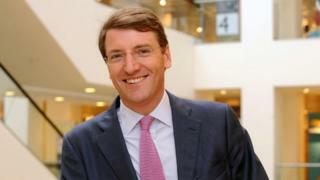 Sir Charlie Mayfield drew attention to figures showing 22% of jobs demand only primary school-level skills. He called for a "step change in the number of people earning and learning" to boost qualifications. Without change, he warned it could get "more difficult" for people to climb the career ladder. two million jobs were created "at the bottom"
1.2 million jobs were lost "from the middle"
Sir Charlie, who also chairs the UK Commission for Employment and Skills, was speaking at the Daily Telegraph's Festival of Business. This dwindling of middle-ranking job opportunities - which can provide a stepping stone for people advancing their career, could limit social mobility "at a time when we need more of that, not less", he said. He contrasted the picture in the UK with that in the US and Germany, where the proportion of jobs which can be performed with just primary school-level attainment is much lower, at 10% and 5% respectively. The figures he quoted are drawn from a section of the 2013 OECD report on adult skills which focuses on the problem of "qualification mismatch". It shows that Spain is the only country with a higher proportion of primary school-level jobs than the UK. A spokeswoman for the Department for Business, Innovation and Skills said that the government is "putting employers in the driving seat when it comes to skills, through industry-designed training and employer-led apprenticeships". "More than 1,000 organisations are already involved in developing high quality apprenticeships in professions ranging from TV production to welding," the spokeswoman added. The Department maintains it is on course to reach its target of creating two million apprenticeships in this Parliament. In his speech, Sir Charlie also described the UK's economic recovery as "job-rich and wages-poor". New ONS figures have revealed that, for the first time in five year, the growth in average earnings, excluding bonuses, in the most recent financial quarter had outstripped inflation. IHS Global Insight's chief UK economist, Howard Archer, told the BBC pay growth would be a relief for consumers but that it is "still really more to do with low inflation than markedly improving earnings".